I'm searching for a black hole in Elite: Dangerous, and I'm doing it simply because I don't know what else to do. You might say I've already found one black hole, and it's sitting in the cockpit of my ship. Despite hours of play and trying my hand at various professions, I'm somehow still not sure what I want to be. Fighter? Trader? Explorer? Miner? I've tried them all out, and nothing is really sticking. It's sort of odd to be presented with the entire Milky Way galaxy and sit there thinking: what the hell should I do with it? But that's where I'm at. Several black holes have already been found in Elite, but I'd like to try finding a new one. I use the galaxy map to examine the systems where black holes have already been indexed. A couple of them have large blue glows that can still be seen even when you zoom out until all the other stars on the map have faded. I search the portion of the galaxy I'm in, looking for something similar. Eventually, I find it. It's designated HIP 23692, and it's just over 100 light years away, which is pretty close, all things considered. I plot a course, hoping not only to find a new black hole, but to figure out once and for all what kind of pilot I want to be. Naturally, I'm immediately interdicted by another ship looking for a fight. I've been submitting to interdictions lately, just to get better at combat, but I still haven't really developed a taste for it. I always seem to wind up fighting a ship with the same turning speed as my own, meaning some fights feel like a fruitless exercise in trying to get behind someone who's always behind you. Bringing down a ship is exciting, but to claim a bounty you need to find a station in the correct system, then dock, then repair your ship and reload your weapons, which eat into the often meager profits. It's a lot of time spent for what is not always a worthwhile reward. I escape the interdiction and make a few jumps, soon discovering a system with a pristine asteroid belt, so I stop to do some mining (I'm immediately joined by a handful of other NPC miners who have just happened to arrive at the same discovery at the same moment). I actually enjoy the act of mining: it's relaxing. But it's also problematic because you need to collect at least one ton of a particular resource for it to leave your refinery and become saleable cargo. What keeps happening is I wind up with just under a ton before an asteroid runs dry, and then I have to spend just as much time looking for the remaining 4% as I did the original 96%. That requires zapping other asteroids and examining their chunks until I find the exact resource I'm looking for. This adds more and more clutter on the radar, so even when I've dislodged the chunks I need, they can be hard to target and collect. What mining needs to really work is an asteroid scanner to determine a rock's composition before you start drilling, so if you're looking to complete your tonnage you can do it without physically chipping into the 'roid. If you could sell that collected data to refinery stations for a small profit, that'd be nice too. I'd also welcome the ability to sell unfinished loads of minerals. Surely, someone would be interested in buying 98% of a ton of platinum at a discount? Unless the game changes along these lines, I think I'm done with mining for the time being. Speaking of goods, I tried the commodities trading racket early on. It's a good way to make money, examining trade routes and hauling goods from station to station, and in the early game it's fun, mostly because learning how to dock properly is initially challenging. Once docking became easy, even the profits from trading didn't make up for the relative drudgery of visiting spaceport after identical spaceport. I've decided to scratch that job off my space-resume, too. With combat, mining, and trading of little interest, I guess I'm left with what I'm doing right now: sheer exploration. Pop into a system, hit the discovery scanner, and see what's there. Often, what's there isn't terribly interesting, which I suspect is probably accurate. Let's face it, with billions of planets, most of them are gonna be duds. Look at our own solar system. You've got Saturn, which is beautiful, and Jupiter, which is huge and stormy. Everything else is a bore. Venus is an oven, Mars is a rock, and while Earth used to be great when it was populated by dinosaurs, now it's just a damp, dirty mudball covered with people tweeting about Beyoncé. Exploring can also be a repetitious drag at times. Surface scans need to be done from a certain proximity, meaning you have to spend a great deal of time accelerating toward far-flung astrological objects and then even more time decelerating before they flash past and require a u-turn, more acceleration, and more deceleration. Sometimes there are dozens of objects to visit, which can take ages. I only have an intermediate discovery scanner, so not only am I sometimes annoyed by how many visits I have to make, I'm also worried that I'm missing some. There are some real highlights to exploration, though. About midway through my trip, I pop into a system and find a cool-looking red metal-rich red planet, a nice change from all the boring frozen or rocky planets I've been finding so far. After examining it, I hit the discovery scanner again, which shows me another contact. 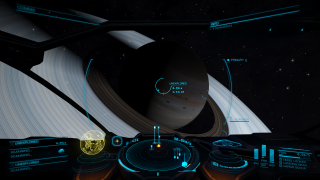 After flying out to discover it's a ringed gas planet, I hit the scanner again, and get another new hit. This continues until I've discovered a deep system full of gas giants. One of them even sports ammonia-based life. It's cool to think about being the first one to discover life on a certain planet, even a planet that probably smells like cat pee. It also gives me profitable data to sell the next time I dock. Finally, after almost six hours of travel, I'm one jump away from the mysterious glowing spot on the map, HIP 23692. Black hole? No black hole? I hold my breath and leap in, wondering if I'm about to be crushed into paste. No black hole. Instead, I find two massive blue Class O type stars orbiting one another (and, of course, the game generates another NPC so I don't get too lonely). There may still be a black hole somewhere—obviously I won't be able to see it—so I fly around, scanning intermittently. After about twenty minutes, I've neither detected a black hole nor died from one. Still, the super massive stars of HP 23692 are beautiful and rare, and I don't think it was a wasted trip. (You can read about the real HIP 23692 right here.) Besides, as I continue star hopping I find a cool station named after Carl Sagan near a sweet little red planet. A nice place to call home for a bit. So, while I didn't find a black hole, at least I've ruled out combat, mining, and trading as professions for myself. I guess I'm left with being an explorer, then? I can deal with that. This trip has netted me about three hundred thousand credits from selling my collected data, and has taken me from the rank of Scout to Surveyor. The black hole in my cockpit is still there, but at least it's got a shape.